Our healthier eggplant Parmesan sandwich uses tender, smoky grilled eggplant instead of fried, so it has a fraction of the fat and calories. To make these sandwiches a cinch to prepare, make sure to have all your ingredients ready before you head out to the grill. 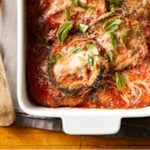 Place eggplant rounds on a baking sheet and sprinkle with salt. Coat both sides lightly with cooking spray. Combine Parmesan (or Asiago) and mozzarella in a small bowl. Brush both sides of focaccia (or bread) with oil. Place spinach in a large microwave-safe bowl. Cover with plastic wrap and punch several holes in the wrap. Microwave on High until wilted, 2 to 3 minutes. Combine tomatoes and 2 tablespoons basil in a small microwave-safe bowl. Cover and microwave until bubbling, about 2 minutes. 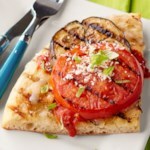 Place all your ingredients on the baking sheet with the eggplant and take it to the grill. 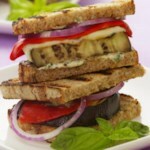 Grill the eggplant slices until brown and soft on both sides, 2 to 3 minutes per side. Grill the bread until toasted, about 1 minute per side. Return the eggplant and bread to the baking sheet. Reduce grill heat to medium. 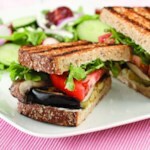 Place 1 eggplant round on top of each slice of bread. 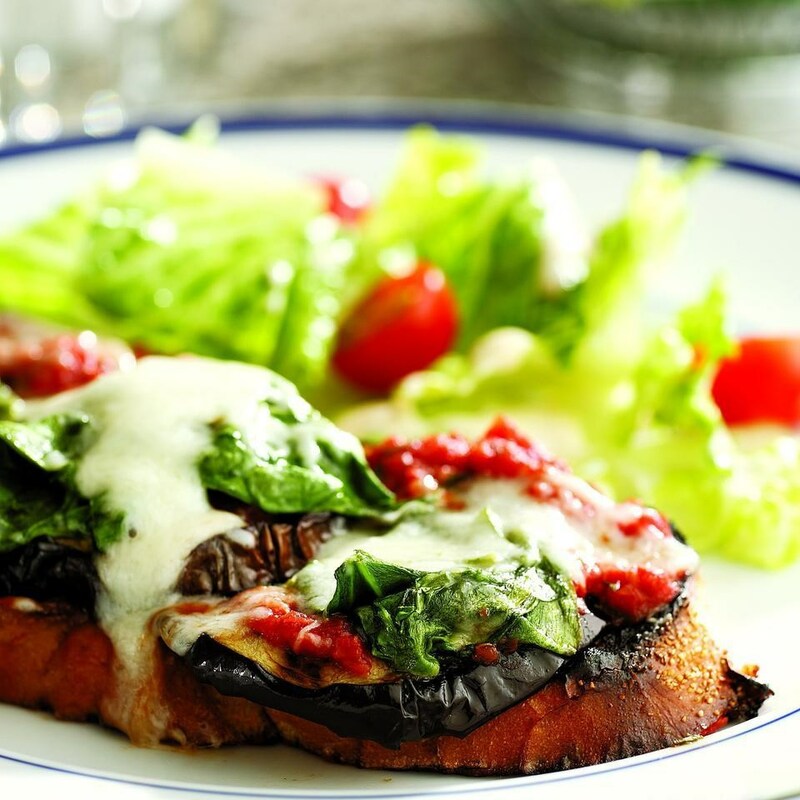 Layer 1 tablespoon tomatoes, 1 tablespoon wilted spinach and 1 tablespoon cheese on each slice of eggplant. Repeat with the remaining eggplant, sauce, spinach and cheese. Sprinkle each stack with some of the remaining basil. 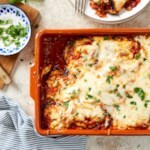 Place the baking sheet on the grill, close the lid and grill until the eggplant stack is hot and the cheese is melted, 5 to 7 minutes. This meal was so delicious. Even as a leftover. I made it for the first time when a friend came over. The unfortunate thing was that I needed to use my george foreman instead of a real grill because it was raining! next time, I plan to make it on a real grill. It was absolutely delicious though. Just made this! It is sooo good. I added some freshly grated parmesan on top of the hot mushroom. YUMMY! This recipt is what I would call fastastic, although I would use in place of part-skim mozzarella cheese, with tofu mozzarella cheese.